Will Trump Raise North Korea's Human Rights Abuses At Summit With Kim Jong Un? "No regime has oppressed its own citizens more totally or brutally than the cruel dictatorship of North Korea," the president said in January. Human rights experts fear the issue may be ignored now. 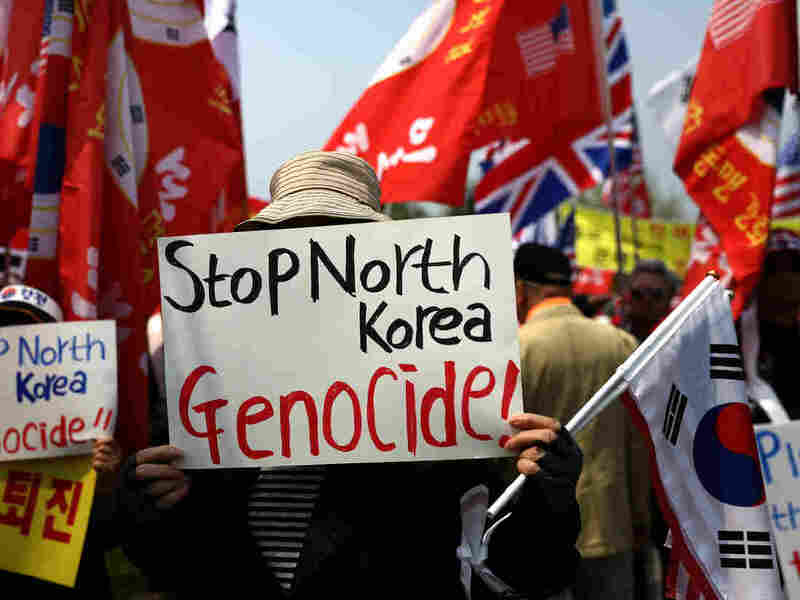 South Koreans protest against the April 27 inter-Korean summit, when North Korean leader Kim Jong Un and South Korean President Moon Jae-in met at the border. "We did not talk about human rights, no," Trump told reporters after that meeting. Human rights experts worry that the way North Korea treats its citizens is getting sidelined in the effort to secure a nuclear deal. "At some point, whether [in] the next summit or other summits to come or meetings, it is very important that human rights are raised," Tomás Ojea Quintana, the United Nations' special rapporteur on the Democratic People's Republic of Korea, told reporters in Geneva Thursday. "Otherwise, first it will be a problem in terms of building a sustainable agreement with DPRK with regard to denuclearization." Avoiding the rights issue, he said, would send the "wrong message." A 2014 United Nations report said the regime commits crimes against humanity including running prison camps, torturing its people and holding summary executions. For North Koreans, says Scott Stevens of the Transitional Justice Working Group, a Seoul-based nonprofit that tracks state-sponsored abuses, the issues include "always being afraid of your neighbors overhearing what radio broadcasts you're listening to, or even having family members disappeared by the state or executed publicly for crimes that most people would identify as pretty minor." Before there were hints of the historic U.S.-North Korea summit, Trump had criticized the regime's human rights record. "No regime has oppressed its own citizens more totally or brutally than the cruel dictatorship of North Korea," Trump said during his State of the Union address in January. In the audience was a defector from North Korea, Ji Seong Ho, who attended as a guest of the president. Ji nearly starved to death during a famine in the mid-1990s, then lost an arm and a leg — they were crushed by a train. He eventually escaped North Korea on crutches. His father tried to flee, too, but was caught and tortured to death. "Your great sacrifice is an inspiration to us all," Trump said, after recounting Ji's journey. Looking back at that moment now from Seoul, where he works as a human rights activist, Ji says it was a great honor to attend and hear the president highlight North Korea's abuses. Since then, he's watched as Trump has swung from maximum pressure to frenzied diplomacy with the North. "What I want to tell the global community is that it's better to focus not on Kim Jong Un, but on the North Korean people," Ji says. "The whole world knows how bad the situation in North Korea is." In an open letter to Kim Jong Un, more than 300 groups, including human rights organizations from around the world, have called on the North Korean regime to reform the way it treats its people. They're hoping President Trump will use the upcoming summit to insist on human rights improvements as part of any security deals. "Obviously, we all have a vested interest in making sure nuclear war doesn't happen. The survival of the human race is important," Stevens says. "But also, the conditions of what we survive in are important. And you really can't downplay the value of human rights." But have human rights already been downplayed? Trump said the topic didn't even come up last week when he hosted Kim Yong Chol. And congressional leaders who are aligned with the president have raised no objection. At a Senate Foreign Relations committee hearing on Tuesday, Sen. James Risch, an Idaho Republican, said America consistently stands up for open societies, but in this case, maybe it's a risk. "Look," Risch said, "we're all about human rights, we always have been, we always will be — that's gonna be us. But if you try to overload this and try to resolve all these things at once, I think you're just setting the thing up for failure." Defenders of human rights challenge that notion. They argue the security threat and North Korea's absence of individual freedoms are connected. "I am not of the opinion that a human rights dialogue will undermine the opening and the talks on denuclearization at all. I don't think that there is a dilemma here," Ojea Quintana said in Geneva. Sokeel Park, the South Korea country director for Liberty in North Korea, which works with North Korean refugees, says any deal should be oriented toward a better life for North Koreans. "If we don't do that, then we're really just dealing with the symptom of the problem and not the fundamental problem, which is the nature of North Korea as a state," Park said. Could human rights still make the summit agenda? After his meeting with Kim Yong Chol, the president seemed to leave the door open. "Could be. Yeah, could be. I think we probably will, and maybe in great detail," Trump told reporters. Negotiators from both sides are still hammering that out. In the audio, we incorrectly refer to Sen. James Risch, R-Idaho, as Sen. Ed Risch.